Malcolm is honoured to hold the Royal Warrant of Appointment to His Royal Highness The Prince of Wales as the maker of all the Prince’s bespoke military uniforms, including those of the Scottish regiments. Officially awarded on 1st January 2014, this appointment comes after previously being the Grantee of The Royal Warrant while Chairman of Welsh and Jefferies when Malcolm tailored the uniform for His Royal Highness for the occasion of the marriage of the Duke and Duchess of Cambridge. 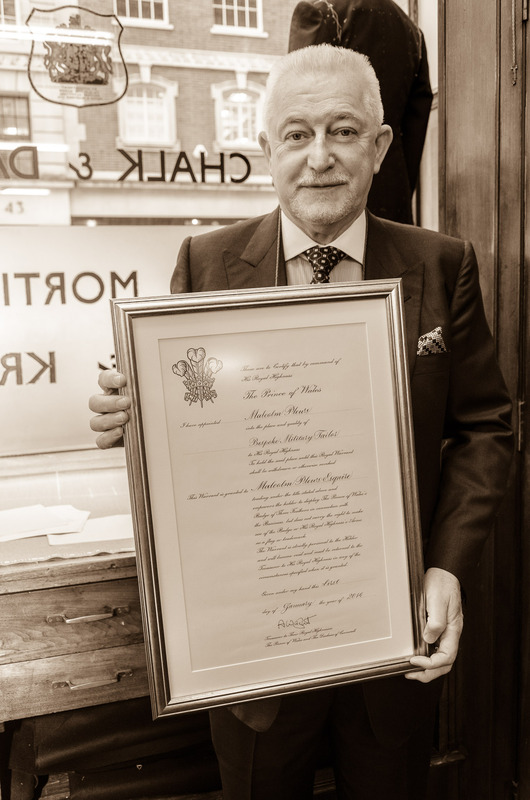 On 1st January 2014, I was delighted to be granted the Royal Warrant of Appointment to His Royal Highness The Prince of Wales as his Bespoke Military Tailor. I have had the pleasure of looking after The Prince of Wales’ military requirements for several years so to be granted the Royal Warrant in my name is, indeed, an honour.